Entries are sold on a use it or lose it basis. No substitutions will be available due to a growing trend of entries being purchased by non- runners to resell at a profit when entries are sold out. The entry cap have be raised by 100 to cater for a slight increase in the no-show %. Registration venue has changed this year, will be on Thesen Island. Please read all the info down below before proceeding to the entry portal. Congratulations to all our runners on Saturday. Yes, we had it all, freezing cold at the start and a beautiful summer day during the run. We trust that you had as much fun in Knysna as we had hosting you. We hope to welcome you back for our other events listed on the front page or for the 2019 edition of the event. We can’t wait! Registration Takes place on Friday 28 June from 10:00 till 22:00. At the under ground parking area on Thesen Island. You will need to Register in Person with proof of ID. No late or Third party pickups allowed due to the persistence of runners swapping entries. This has serious medical and race result consequences as you entered a formal road race competition. Runners that make their entries available to non-entrants are committing race fraud and can have bigger fallout. These requirements were highlighted at the point of entry and are not open to discussion. 5 Km Fun Run 29 June 7:30 start – Caltex Garage, Waterfront Drive. You can only get to the start in the Forest with the Event organized Taxi Transport. No private Vehicles will be allowed near the start area and will be turned away at the roadblock. No Spectators or runners that have not registered on Friday will be transported. Parking Marshals will b on hand to assist with Parking at Loerie Park. Taxi transport load from 4:30. Near Loeri Park. 42km runners need to be on a taxi by 6:00 or they will miss the start. The start will not be delayed due to late arrivals and Taxi transport will stop at 7:00 even if you are in a loading queue. Do not delay loading by trying to ride with friends in the same taxi. If your group gets split, you can catch up with them at the Taxi Drop-off point. There is still a 1.5km Forest walk from the Taxi drop off to the start area. Warm coffee and rusks will be available at the start from the kitchen tent in the Forest. We have placed as many toilets at the start as we can fit in. Plan your morning well as race jitters can play havoc with your bathroom schedule. Do not leave the secure area as there are many steep cliffs and other dangers outside of the controlled area. Biddulphs will provide trucks to bring your Tag-bag from the Forest back to the Finish in town. Your race number contain a tear-off section to be attached to your tog-bag. There is a cable tie in your goody bag for this purpose. Tog-bags will be available from 10:00 on the field. We do not assume any responsibility for valuables placed in your tog-bag. Donation Clothing and Blankets must be handed to the collection Marshals at the clothing trucks. Do not place blankets or clothing into an outstretched hand as this leads to excessive growth in numbers of Private people making their way to the start. Your personalized electronic timing chip must be correctly folded and attached to your shoe for a finishing time. Timing is gun to gun and not from Start line to Finish line. Due to lack of space there is NO seeding and an early arrival is your best bet to get a good start. The course is mostly gravel road and the last 6 km is run on tar. Trail running shoes is not required. Drinks stations will have soft drinks and water and is spaced roughly 3km apart. Do your best to deposit cups and Sachets in the collection bins to ease our load with route cleaning. Do not through anything in the Forest as we will then not be able to recover it. Run on the right had side of the course at all times to leave space for residents and emergency vehicles.. 42km runners will be overtaking slower 21km runners on the last 7 km. Remember that they will still be racing at this point and do not want to fight their way through slower runners having a gingerly stroll – 5 wide. 42km Cutoff time is 5 ½ hours. The provided race number include the telephone number for the Event Operation Centre and not your own emergency number. This number is to be called in case of extreme emergency only. If you get into difficulty and cannot finish the event you must make your way to the next water point and await the arrival of a sweep vehicle. Ambulances are reserved for severe emergency only and will not provide rubbing services. Earphones will not be tolerated on the course as you will not hear vehicles approaching from behind and you could delay emergency vehicle response time. Point this out to those inconsiderate runners that persist with Earphones. 21km runners will finish to the left of the Finish chute and 42km runners to the right of the Finnish chute. Once you cleared the Finish arch, keep moving to Medals and Final drink and vacate the finish area. The medical tent will be located next to the Final drinks area on the right of the chute. This is for emergency medical assistance only. Pre arrange a meeting place on the Field with your Family. Left-over T-shirts will be on sale at the field. Prize giving is from 12:45 under the Bedouin Tent next to the Expo/Registration area. Prize money will be paid via EFT. To be in contention for the R10 000 spot Prize, you have to be present in the prize giving area. The MC decision is binding in this regard. The Head Referee will be available till 30 min after Prize giving to receive Podium Disputes. No disputes will be entertained after this time. The venue security will be able to direct you to the Lost & Found area. No shower Facilities are available at the Finish. The Knysna Marathon Club House is located at Loeri Park and will be open for Post event Showers. First time entrants will need to create a login profile on our portal page. To do this click ” Join” in the top right corner on the Entry portal. Our Partner event, the Knysna Cycle Tour take place on the weekend of the 22nd of June to 23rd of June 2019. Click on the image to be redirected for more info. Well, we stopped measuring the yearly collection of clothing and blankets for the needy in terms of bakkie loads and now need to refer to the amount of Truck loads. We as the race team are humbled by the way you open your hearts to the Knysna Community. We wish we could share every thankful smile with all of you as the clothing and blankets are being handed out. It always leaves us with a lump in the throat. Big was the joy when we collected a total of over 3000 blankets for distribution. Most of these have already found a home and is warming more than a heart at the moment. How do you measure a gift of warmth? Well, you did it! 2018 saw us Equal our record of over R 1 Million payout to our deserving Non Profit organisations as well as the yearly selected Charities. Only with your help can this figure be achieved again. Dare we hope to do even better? With your help we can! News: With your race number you will be issued with a timing chip linked to your profile. 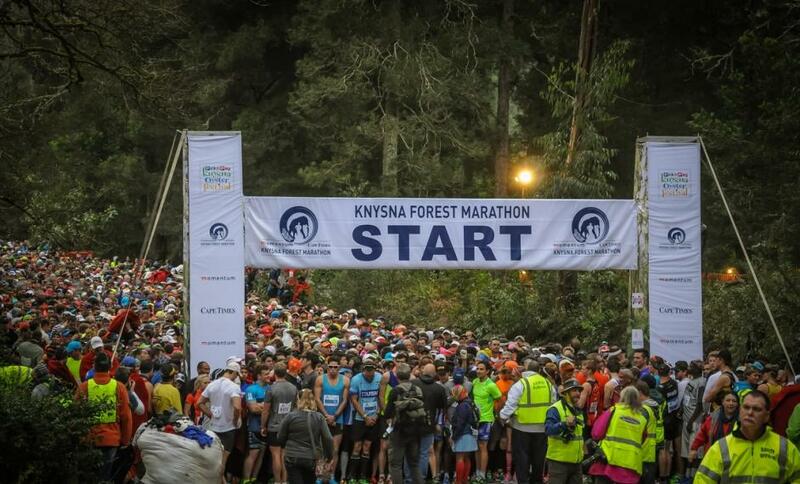 You will receive your Knysna Forest Marathon Timing chip free of charge!! Full Marathon will get the needed attention and focus. Registration open Friday 28 June from 10:00 till 22:00.